In this step by step, Dennis Mathewson shows us how he takes Leonardo da Vinci's famous Vituvian Man and makes his very own unique version. The ASBS team liked this motif so much that is has now become the new design of the official ASBS T-shirt. Even if photorealistic flames aren't really anything new on the airbrushing market, they're still very popular amongst many airbrushers and their customers. In her step by step, Tatjana Boesl shows us how you can create the fascinating fire effect using just a little bit of material and in only 10 short work steps. The red curly hair from Esmeray coined its impression in Meinrad Froschins memory from the very first time he saw her. It was a portrait-in-waiting, one he has eternalized in this step by step. Admittedly, it's actually an iguana and the crown is actually the ridge of his back. Nonetheless, Paco del Mars' motif could easily be right out of a fairy tale. In his step by step, he shows us how common illustration techniques can be made optimal use of on a metal background. Cool, blue colors huddle against the motif of the mysterious creature and give the impression of a fairy-like being swaying in the water. His creator is Stefan Bleyl, who throws some light on the dark realms of the sea kingdom in his step by step. The United States Army Old Guard Fife and Drum Corps was in need of some new drums – and found them right in Switzerland, of all places. A drum builder in Basle received the prestigious order and commissioned airbrush artist Gilles Bachmann for the instrument design. Some actors wish for his level of TV success, but this guy is actually "just" an airbrusher. Ryan "Ryno" Templeton is brushing in three tuning series that are shown across the planet. In his interview, he tells us about his path from T-shirt painter to independent custom painter to documentary soap star. Andrea Mistretta takes a look back at over 30 years of her continuous career and talks about the tradition of poster-making for American carnivals as well as her development as an airbrush artist and illustrator. She uses two examples, one from 1988 and one from 2012, to document the transformation of her work techniques. 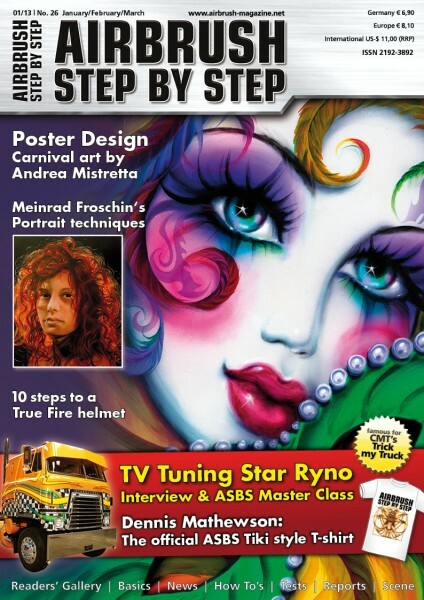 Related links to "ASBS Magazine 01/13"
Customer evaluation for "ASBS Magazine 01/13"